Its in June - but its the Pathfinder March! The Pathfinder March is a challenge of endurance and stamina. The intent is to complete the Pathfinder Long Distance Walk in less than 20 hours. The Pathfinder Long Distance Walk is a 46 mile (74Km) route that takes in the four main bases of the PathFinder Force (PFF) (RAF Wyton, RAF Gravely, RAF Oakington and RAF Warboys). SIYT members and volunteers took part part as solo walkers and as a relay team. This event (on Sunday 22nd March 2015) is the season opener for many riders and gives everyone the opportunity to get that magic 100 in without the pressure of a Classic Sportive and there are 67 mile and 30 mile route options too. The route winds in way around four counties starting and finishing in St Ives, Cambridgeshire, on quiet roads without the mammoth climbs of other events. The ride will not be timed as to take away the pressure for our newcomers to sportive events, and keep cost to a minimum. SIYT will have a team of enthusiastic riders of all ages and there are training sessions planned each Sunday – meet 10am at the Guided Busway Car Park – until the event. Lycra isn’t compulsory but padded shorts are a must regardless of how silly they may look. You can use this link to create your own JustGiving page and raise money for SIYT, to reach our target of £15,000 we need everyone taking part to help to raise £100. You would be making a huge difference to a great local charity. Create a page - easy for sharing with friends and colleagues by email, Facebook, Twitter or your social media weapon of choice. Exercise is important at any time of year, but it's important to be in good shape for the onslaught of the holiday period. 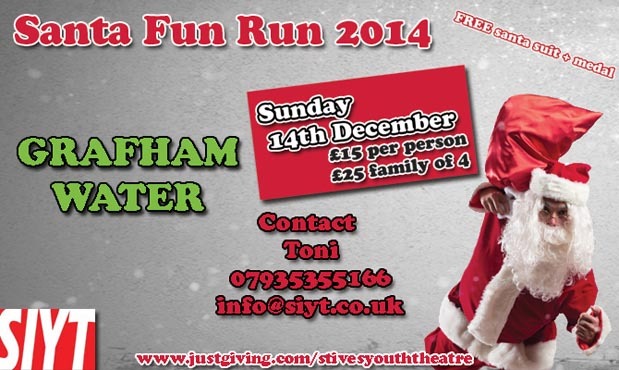 What better way to make sure that happens by taking part in our Santa Fun Run. For an entry fee, you a santa suit and medal to take part in trek around Grafham Water - there is a choice of a two and half mile or a nine mile circuit, walk or run. This event raised over £650 for SIYT.